USA Today’s cover story on rising salaries for college football head coaches held few surprises: The heads of massive programs in the Big 12, Big Ten and Southeastern Conference make the most, while folks in the Sun Belt and other lower-level conferences are in the low six figures. 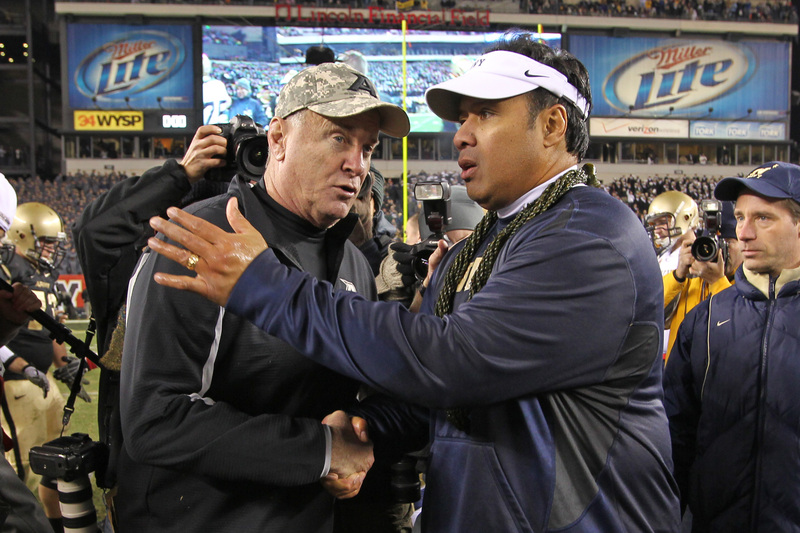 Among the service academies, it’s no surprise that Navy’s Ken Niumatalolo leads the pack. After racking up 27 wins in his first three seasons — the best start for a coach in school history — Niumatalolo signed a contract extension in April. According to USA Today’s figures, he’ll make $1,538,190 in 2011. Both Calhoun and Ellerson have bonuses that could drive their paychecks up significantly — USA Today lists Ellerson’s max bonus at $350,000, with Calhoun’s at $247,500. Calhoun also will pull down about $23,000 in “other pay” this year, according to the salary database. It’s not all about money, of course — there are games coming up Saturday: Niumatalolo’s Midshipmen head to San Jose State (Mike MacIntyre, $401,820 salary in 2011), Calhoun’s Falcons host UNLV (Bobby Hauck, $500,000), and Ellerson’s Black Knights visit Temple (Steve Addazio, salary not listed). Who pays these salaries? Why are the service academy coaches’ salaries not capped like other federal employees? Does the football coach really deserve that much more than the 4-star service chief? They are not federal employees. They are employees of the Academy’s athletic department and are paid for by funds from the Athletic Association. The athletic department employees are not paid using federal money. Their money comes from athletic event revenue and donors/alumni. This is done so that one can’t bankrupt the other and that the Academies are able to attract top quality coaching staffs since the sports are important to recruiting efforts.